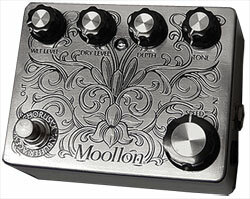 Moollon Chorus has thick and rich analog chorus sound with a wide control range. The original Panasonic BBD chips were selected for the ultimate analog chorus sound. Extraordinary feature of Moollon Chorus is that Dry and Wet signals can be controlled separately so you can control not only the overall volume level but also the mixture ratio of Dry and Wet signals freely. This function ranges from vibrato to chorus sound with extra wide expression and makes this pedal stand out from the other chorus pedals with wet level controls only. Depth control adds even more detailed interaction to this pedal by adjusting the depth of pitch modulation. Tone control is for wet signal only, and it ranges from warm vintage to sparkling modern chorus sound. With the big Speed control knob located at the bottom of front panel, you can change speed level freely with your foot while you are playing instruments. The first time I heard the Moollon Chorus where at the winter Namm show in 2006. I met Peter Stroud in the 65 amp booth where he demoed the 65 London amp for us. He had the thickest sound ever, with tons of swirling tones pumped out of that little amp. Before I even know it where the Moollon Chorus I fell i love with the sound right on the spot. I had to ask Peter how he got the sound and he show me the Moollon Chours. The funny thing were that my next planned stop at the Namm show where to meet Steve Kim at the Moollon booth to pick up this specific pedal! For me this is the best sounding Chorus I ever heard. Its big, fat, alive and got the raw type of leslie/vibe sound that Landau capture when he play live. The pedal is very dynamic and works really good with other pedals. This pedal makes me wanna play for ever. The Dry/wet function is a killer function and is so helpful to have when you shape the sound. From slick Police to raw Vibe like Landau tones.